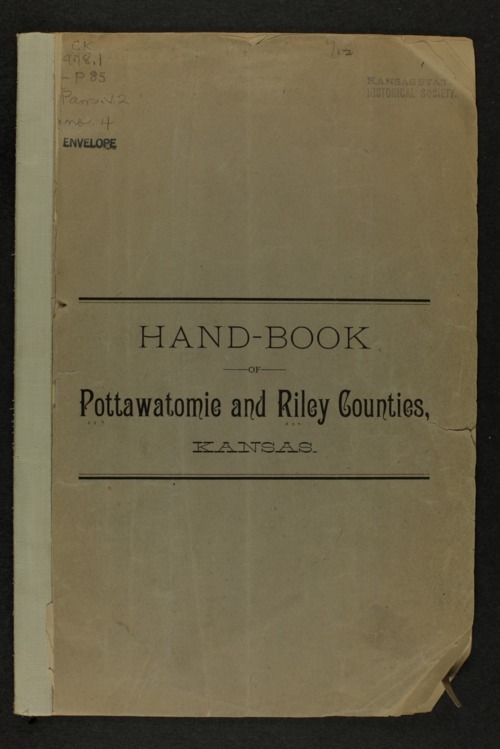 This handbook was published by the Modern Argo, Kansas City, for potential immigrants to Pottawatomie and Riley counties in Kansas. A short description of Davis County is also included. This pamphlet encouraged agricultural settlement by extolling the virtues of this 'beautiful Kansas (river) valley'. Crops grown in the area included corn, wheat, oats, and rye. A number of stock farms, such as Juniatta Stock Farm and Woodside Stock Farm, are described in the booklet. The booklet contains information about dairying operations and orchards. There are descriptions of the towns of Manhattan (including the State Agricultural College), Wamego, Louisville, Westmoreland, Milford, and Belvue. Some illustrations of farms and businesses are also included.